What's the Best Way to Tie Your Shoes? Physics May Have the Answer. The most common mistake when tying your shoelaces is accidentally making a weaker granny knot instead of the stronger square knot. Now, physics can help you tie the perfect knot that stays tight no matter what. While it is well-known that any knot’s strength depends on its configuration, nobody really understands specifically why this should be the case. With a recent paper in Physical Review Letters, a team of physicists has taken an important step forward in unraveling this mystery, boiling it all down to a single equation that predicts the strength and shape of a simple knot. Knots have long been a focus of study for mathematicians in the abstract, but modeling their physical characteristics in the real world is notoriously difficult, even with computer simulations. MIT mechanical engineering researcher Khalid Jawed explained the problem to Gizmodo. “If you tie a knot and study the shape with the naked eye, the twists and turns are fairly complicated,” producing a mix of interacting forces. Any mathematical model must account for all those twists and turns, including such variables as tension, friction, and the stiffness of the material — whether it be shoelaces, rope, headphone wires, nylon, surgical thread, or even folding proteins and DNA. Back in 2008, French mathematician Basil Audoly, of Sorbonne Universities in Paris, thought he had found a way to do just that. 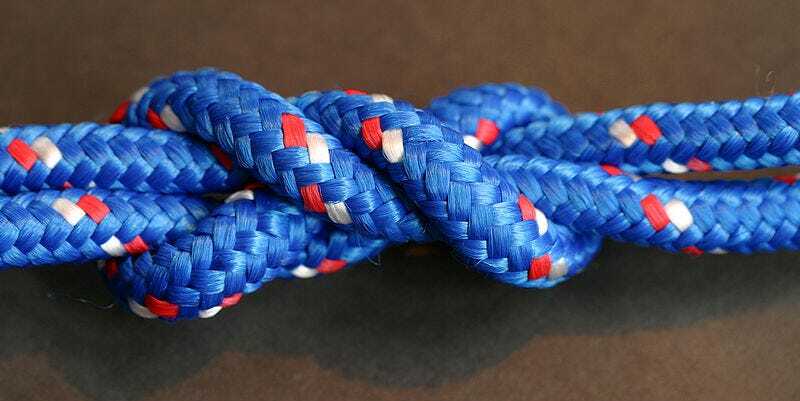 It worked well for very simple overhand knots with only one or two “turns,” such as a trefoil knot, made by making a loop and passing one end of the rope or thread through that loop. He figured it would be a simple matter to extend the basic concept to more complicated knots with more than two turns. But then Jawed and his MIT colleagues decided to test Audoly’s theory and ran a few knotty experiments of their own, using nickel titanium wire clamped to a table in the laboratory. They used a mechanical arm to pull the knots tight, measuring the force required to close the loop for knots with an increasing number of turns. Surprise! They found the amount of force needed to tie a knot changed radically as the number of turns increased. You’d think that with each additional turn, you’d need to exert just a bit more force to tighten the knot — a linear connection between the number of twists and the strength of the knot. But the MIT group found this linear connection didn’t hold. If you have one turn, and then you make a second turn, you’d need between four to eight times more force to close the knot — the force required increases by a squared or cubed law. So a complex knot with two turns requires 1000 times more force to close the loop than a knot with a single twist. But why does this happen? It all comes down to friction. For a simple knot with just one or two turns, the dominant variable is the stiffness of the material; friction is so negligible, it can be ignored. But as the number of turns increases to three or more, “you’re increasing the contact area in the tangled region of the knot, and that generates a lot of friction,” Jawed explained. So the new model had to account for frictional forces as well as stiffness and topology (shape). Intrigued by the MIT group’s finding, Audoly joined forces with them to develop a better theory that could explain these surprising experimental results. They came up with an equation that describes exactly how the various forces at work in a knot — tension, friction and stiffness — relate to the number of turns (the knot’s topology). Despite its predictive power, this is not (yet) a “Grand Unified Theory of Knots,” applicable across the board for every possible variety. It only describes the simplest possible knots. But it is an excellent starting point. Simple knots are the building blocks that form more complicated knots, and the authors are optimistic that they can extend their approach to increasingly complex knots using computer simulations. That would be good news for tailoring specific configurations of knots for different applications. Surgeons sewing up wounds could “tune” the strength of their knots depending on the number of turns they use. It could also lead to tunable shock absorbers, and improve our understanding of the complicated untangling of fibers involved cell division. Top image: Surgeon’s knot tied in nylon rope. Credit: Tom Murphy VI (via Wikipedia). Bottom image: Jawed et al./Physical Review Letters. Jawed, M.K. et al. (2015) “Untangling the mechanics and topology in the frictional response of long overhand elastic knots,” Physical Review Letters 115: 118302.